The interactions between food production, energy production, and water supplies, sometimes referred to as the food-energy-water (FEW) nexus, are critically important to sustaining society. Two components of this nexus, energy and water, are strongly interrelated: Generating electricity and refining fuel require us to use water; pumping, delivering, and treating water require us to use energy. Links between the energy and water systems are expected to intensify in the future. Therefore, it is important to understand and foster continued attention to the interdependency between the systems in the energy-water (EW) nexus [U.S. Department of Energy, 2014]. Developing educational approaches focusing on this relationship is critical to building the next generation of scientists, engineers, and other professionals in the energy and water supply sectors. However, current undergraduate curricula typically lack the content and resources to address the complexity of the EW nexus, and most of the recent educational efforts are focused at the graduate level. To address this, we have developed a Web platform and a pilot learning module focusing on energy and water in an effort to address EW nexus educational needs. The HydroViz Nexus platform can be used in upper-level undergraduate and graduate courses that deal with water resources and sustainability topics within disciplines such as civil engineering and geosciences. We put particular emphasis on thermoelectric power generation (converting heat from burning fuels into electricity). Efforts to develop meaningful nexus educational experiences that go beyond reading assignments or qualitative-type analysis face several challenges. These include a lack of prior experience on the part of educators who design teaching materials that address the EW systems; lack of accessibility to and usability of nexus data sets, modeling, and analysis tools; and curricular constraints. Our platform includes student-centered activities using actual energy-water data sets from around the United States. To overcome these challenges, our platform follows an active-learning approach and includes a set of student-centered activities using actual EW data sets from around the United States. The platform supports easy access to interactive data analysis and visualization tools and engages students in authentic contexts of EW problems at the scale of a hydrologic basin for any of the contiguous states in the United States. Additionally, the platform provides embedded support to check student comprehension and provide assistance on demand. The platform doesn’t require any specialized capabilities other than access to the Internet and standard spreadsheet software. Open-source geographical information system (GIS) software may also be used but is not required. In developing the Web platform, we built a suite of spatially distributed EW data sets over the entire domain of the United States. 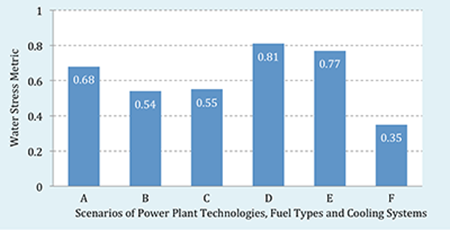 The data sets include water supply and water use by major sectors of municipal, industrial, agricultural, and thermoelectric power generation (Table 1). Data on water supply and demand are provided for surface and groundwater sources, as well as projections for water use in 2030 that factor in population growth. The platform houses data on all power plants in the United States, including information on plant capacity, energy generation, fuel type, and cooling technology for each plant. The platform also includes other relevant state-specific information on energy production cost, retail prices, consumption per capita, carbon emission rates, and population projections. The Web-based EW nexus platform and the pilot module are housed as part of the HydroViz hydrology education project. The platform interface (Figure 1) integrates a lesson tab that provides access to the full learning content of each section and a map tab with an interactive display of geospatial layers. A key feature of the interface is a tool that allows selection, filtering, spatial visualization, and basic statistical summaries of the EW data sets. Students can interact with the EW data sets at various spatial scales, from one basin or one state to the entire United States. The interface provides user support mechanisms in the form of screencasts, tutorials, and interactive quizzes with immediate feedback. The module interface includes sections titled “Rate Your Learning” with survey-type questions to gather student perceptions on whether the module contributed to their learning. Fig. 1. 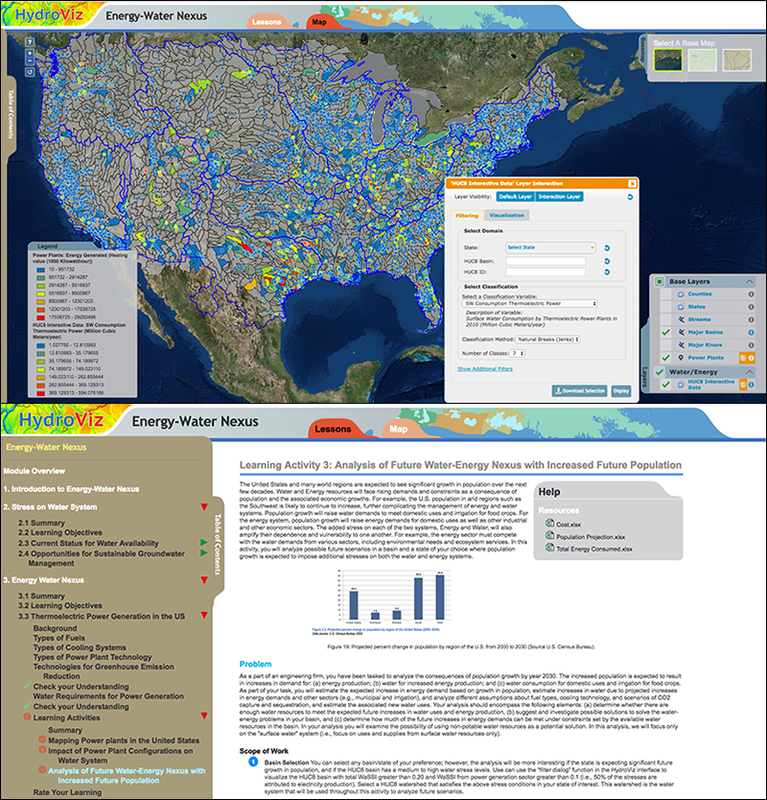 Interface of the energy-water nexus Web platform, including (top) an interactive map tab for displaying different water and energy data sets and (bottom) a lesson tab for accessing the educational content and students’ quantitative activities. Fig. 2. 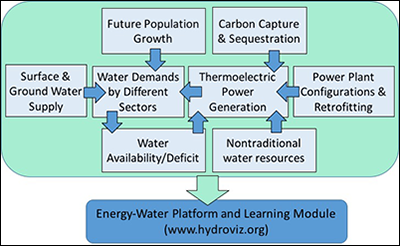 The platform and the learning module developed in this study address key components of the energy-water nexus and their interconnections. We designed these activities using recent research on EW problems as a guide [e.g., Tidwell et al., 2014; Eldardiry et al., 2016]. We also employ inductive learning strategies that promote students’ engagement in making predictions, observations, and reflections [Prince and Felder, 2006]. Each activity starts with a background section to ensure adequate coverage of the subject matter. The platform provides a list of key learning outcomes to ensure students’ awareness of their own learning and to assist instructors in designing evaluation metrics and rubrics. The first set of learning activities guides students to examine water supply from surface water and groundwater sources and water use by the irrigation, municipal and industrial, and thermoelectric sectors. Students calculate water stress indexes at different U.S. basins and identify regions with water availability or shortages. These activities highlight the alarming rates of groundwater depletion in many U.S. regions. Students then reformulate the water stress indexes focusing on groundwater, identify how much groundwater the thermoelectric sector uses, and explore opportunities for reducing groundwater use by tapping into nontraditional resources like treated domestic wastewater. The next set of activities focuses on the energy system and the impact of different power plant configurations on water consumption. Students pick a basin in a state of their choice and analyze alternative retrofit and upgrade options for an existing power plant. They then analyze how changing the plant cooling system (e.g., recirculating versus once through), changing fuel type (e.g., coal, natural gas), or limiting greenhouse gas emission (e.g., via carbon capture and sequestration) would affect the water stress in the basin (Figure 3). Fig. 3. Students select a basin and analyze different scenarios of power plant configurations in the basin (assigned letters from A to F) to assess the effects on the water system. In the last set of activities, students assess the interaction of energy and water systems under future scenarios of population growth. These activities are presented as an open-ended problem for which students can pursue the analysis in different directions. For example, students can project thermoelectric water use according to assumptions about future demand for electricity, which is controlled by population and per capita use. They can vary input parameters (e.g., portfolios of power plants, scenarios of population growth), assess the effect on water use, and predict whether enough water is available (Figure 4). Students then can reflect on how an increase in energy demand may infringe on water availability for other sectors, if the use of nonpotable water resources can alleviate such infringement, and where such alleviation might be most effectively applied. Fig. 4. Students use the energy-water platform to estimate net availability of water-for-energy resources and stresses on the water system (main panel) under different future scenarios of population growth, plant retrofitting options, and potential use of nonpotable water resources (small inset). The Web-based platform supports independent instructors who wish to develop their own EW student learning activities. The Web-based platform supports independent instructors who wish to develop their own EW student learning activities. The learning module presented here is a pilot effort for EW education, and we encourage community members to contribute additional EW data sets and modules. The platform and the module described in this study focus on water use for cooling thermoelectric power plants. However, the data sets built into the platform, the interactive data, and the visualization tools are generic enough to support the formulation of other EW problems driven by specific discipline and curricular needs. Future efforts could concentrate on energy-for-water analyses (e.g., large conveyance projects, agricultural pumping, and water treatment) and the economic and policy aspects of the EW nexus under future scenarios of urban development, climate extremes, and growth in energy demands. This work can also be extended to a more comprehensive model that addresses the full spectrum of the food-energy-water nexus. Assessment of student learning is a critical component of any educational initiative, so a preliminary implementation in our civil engineering department is currently underway to identify areas for improving the platform and to better understand challenges in developing more advanced EW learning activities. This project was funded by a TUES-II grant from the National Science Foundation (award 1122898) with a supplemental FEW award. Hanz Unruh and Seth Benoit from the University of Louisiana at Lafayette tested earlier versions of the module. Upmanu Lall from Columbia University contributed to the initial formulation of student activities. Eldardiry, H., E. Habib, and D. M. Borrok (2016), Small-scale catchment analysis of water stress in wet regions of the U.S.: An example from Louisiana, Environ. Res. Lett., 11(12), 124031, https://doi.org/10.1088/1748-9326/aa51dc. Macknick, J., et al. (2012), Operational water consumption and withdrawal factors for electricity generating technologies: A review of existing literature, Environ. Res. Lett., 7(4), 45802, https://doi.org/10.1088/1748-9326/7/4/045802. Prince, M. J., and R. M. Felder (2006), Inductive teaching and learning methods: Definitions, comparisons, and research bases, J. Eng. Educ., 95(2), 123–138, https://doi.org/10.1002/j.2168-9830.2006.tb00884.x. Tidwell, V. C., et al. 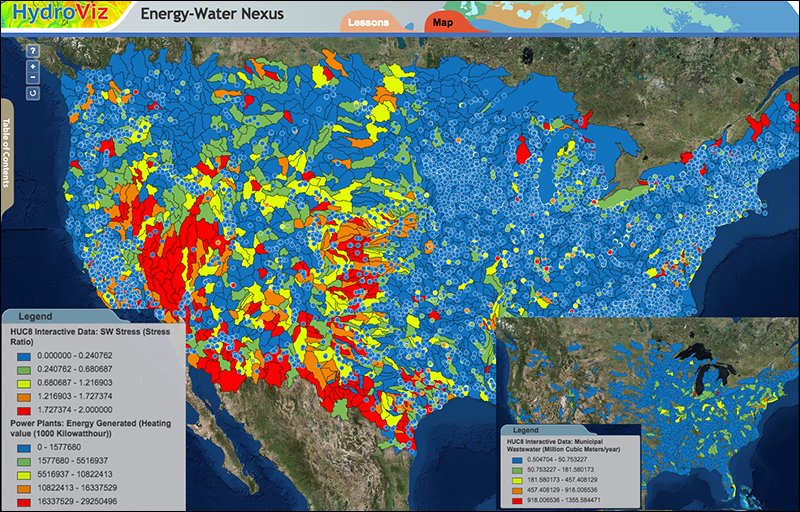 (2014), Mapping water availability, projected use and cost in the western United States, Environ. Res. Lett., 9(6), 64009, https://doi.org/10.1088/1748-9326/9/6/064009. U.S. Department of Energy (2014), The water-energy nexus: Challenges and opportunities, Washington, D. C.
Emad Habib (email: [email protected]) and Hisham Eldardiry, Department of Civil Engineering and Institute for Coastal and Water Research, University of Louisiana at Lafayette; and Vincent C. Tidwell, Sandia National Laboratories, Albuquerque, N.M.
Citation: Habib, E., H. Eldardiry, and V. C. Tidwell (2017), New online tool teaches students about the energy-water nexus, Eos, 98, https://doi.org/10.1029/2017EO084487. Published on 31 October 2017.